Sugary Sweet… Not Such a Treat? From birthday parties to holiday feasts, nearly every joyous occasion we celebrate is accompanied by a host of sugary desserts that puts on pounds and leaves our blood sugar sky high. While there is a definite rapture in the taste of these decadent delights, it isn’t only the taste that makes it so hard to resist the chocolate lava cake or the key lime pie. Your brain actually gets a kick too. When you eat sugar, or even look at an enticing dessert, dopamine, a neurotransmitter that is part of the brain’s complicated reward system enabling us to anticipate and experience pleasure, floods into your mesolimbic pathway. We then experience a blissful sensation. The more often we reward our brains with sugar, the greater our dopamine response becomes. 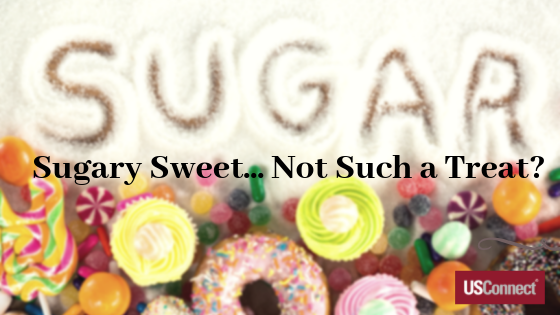 This is why people will experience “sugar cravings.” Much like an addiction, sugar is a difficult temptation to resist, especially when we are confronted with it in so many places. The real kicker is that sugar is included in so many foods you eat, you may not even realize when you’re eating it. Did you know that iodized salt contains a tiny quantity of sugar in the form of dextrose? Yep. You heard it right folks, there is sugar in your salt. The reason it’s important not to consume too much sugar is the indisputable connection between sugar consumption and obesity. Obesity greatly increases the chance of developing type 2 diabetes. It has also been linked to high blood pressure, high cholesterol, and cardiovascular disease. There has even been some speculation and provocative research by Rainer Klement and Ulrike Kammerer in Germany (1), about slowing cancer growth by restricting sugar in the diet of cancer patients. Excessive sugar intake contributes not only to weight gain and its associated problems, but also to tooth decay. If you are able to reduce the amount of sugar in your diet, you will probably also reduce your risk of developing many of these medical conditions. 1. Stevia is extracted from the South American plant known as Stevia Rebaudiana. It is a natural sweetener with zero calories. In human studies it has shown no connection to adverse health effects, and in fact has some health benefits. 2. Xylitol is extracted from the wood of birch trees and from corn, and exists naturally in many fruits and vegetables. A sugar alcohol, the taste is similar to that of sugar but it has 40% fewer calories with a total of 2.4 calories per gram. Like Stevia, xylitol does not share the harmful effects now attributed to sugar and also has some health benefits. 3. Erythritol, like xylitol, is a sugar alcohol with even fewer calories. It only has 0.24 calories per gram, which is 6% of the calories in sugar. Tasting even more like sugar than stevia or xylitol, many people find this an easy change to make. Your body can not break down erythritol and so it is simply excreted in your urine without having the negative impacts that sugar has. 4. Yacon Syrup is another sweetener derived from a South American plant, the yacon plant, also known as Smallanthus sonchifolius. This sweetener is a dark liquid bearing a similar consistency to molasses. The sugar molecules in yacon syrup can not be digested, and therefore the caloric impact it has on the body is about 1.3 calories per gram. This sweetener has also been shown to reduce the feeling of hunger by suppressing the hormone ghrelin, which may help you curb your eating. This syrup should not be used for cooking, because high temperatures break down its structure. It is fine for sweetening tea or coffee, oatmeal, and cold foods. It is important to note that one side effect shared by all of these sugar substitutes, except for Stevia, is that in excess, they may cause some individuals to experience bloating, gas, and diarrhea. Also, Xylitol is extremely toxic to canines, and care should be taken to keep it away from dogs. So, the next time you are staring down the dessert table at your cousin’s wedding, maybe you can check to see if any of the items were made with a natural sugar substitute. You might be able to enjoy the satisfaction of sweetness without the guilt or worry that comes with sugar.